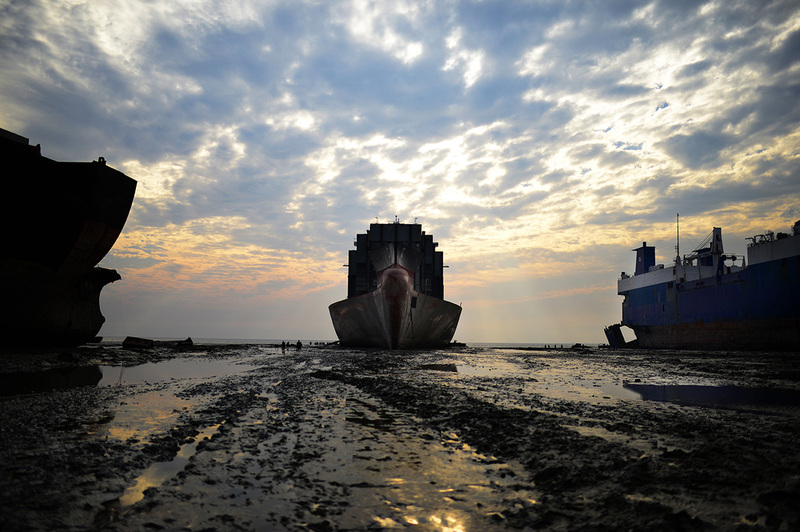 This photographic series features my unique opportunity to witness the impressive ship-breaking yard, located just outside the city of Chittagong. Behind razor-wire lined high concrete walls, one of the world’s most controversial scenes unfolds. Hulking masses of tankers and cargo ships lie dormant on an isolated beach; sombre figures, antipodes against a pale sky. Each entropic tanker is either mostly intact or is in the process of being stripped apart to its basic frame. The hazardous, unregulated nature of this work has permitted exploitation. Strict recycling laws and ‘environment care’ programs in the developed world have created a dangerous industry to flourish among the superstructures. The ships are painstakingly torn apart by groups of poor local laborers facing some of the most dangerous daily working conditions on earth. Their mission, to re-sell anything of worth. No matter the cost. The workers are offered little compensation. Stories of tragic accidents – workers burnt alive or killed by falling fragments from the body of the beasts are a constant reminder of the sacrifice made. With almost eighty active breaking companies stretched along the coast, the once popular tourist attraction has undergone a dramatic shift and no longer welcomes foreigners. In a nation of extreme poverty, the ship-breaking yard offers the desperate community a pseudo-successful chance at a ‘better life’. In Chittagong however, only a minority of families truly benefit from bringing this type of work to Bangladesh. The breaking yard is a place where beasts of burden are left and forgotten.